Quantification of functional melanoma antigen (Melan-A/MART- 1) specific T-cell response using dual IFN-γ and TNF-α intracellular staining. T-cells were incubated with dendritic cells (DCs) pulsed with increasing amount of Melan-A/MART- 1 peptide. 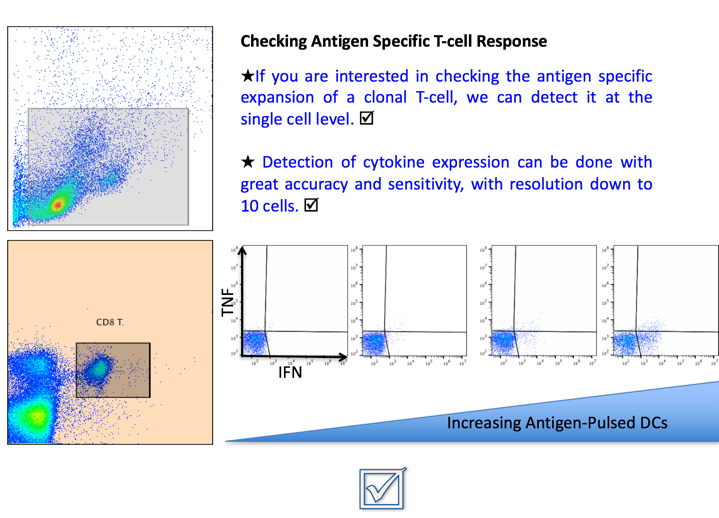 IFN-γ and TNF-α produced by Melan-A- MART-1- specific T cells were quantified by flow cytometry after gating on CD8+ T-cells. WE KNOW HOW THE CELLS RESPOND TO YOUR CALL (TREATMENT), AND WE CAN CORRELATE IT TO ANY IN VITRO FUNCTIONALITY ASSAY. PLEASE CHECK OUR PLATFORMS REGULARLY FOR A VARIETY OF APPLICATIONS. EVERY MONTH, WE ARE DEVELOPING A NEW ASSAY SYSTEM.